Have a question for us? Take a look at our Frequently Asked Questions page for a quick answer. Most common questions about our Aviation Stickers, Pilot Bag Luggage Tags, ordering and shipping information can be found below. Can't find the question you are looking for? Contact Pilot Expressions. Q: What are your stickers made from? A: Our stickers are made from water resistant 4 mil. white vinyl and features a high gloss and UV coating. Q: I have a nylon bag, will they stickers stick to it? A: Yes! Our sticker stick to most flat surfaces including ballistic nylon materials that are used on most roller and kit bags. As long as the surface remains taut and does not bend excessively, they will stick. Our stickers have been used on Luggage Works and Luggage Pro brand bags. Q: Why do you use a smaller size than normal bumper stickers? A: Our stickers are catered to pilots, in-flight crews and other aviation enthusiasts who like to use stickers on their luggage, electronic flight bags, chart binders, etc. These objects are much smaller than a car and therefore do not need to be of large size. We have specifically measured our stickers to a convenient size for bags and other smaller objects. However, since our stickers feature a UV coating and are made from the same materials as regular bumper sticker, our stickers have the same functionality and look great on cars and even airplanes! Q: What type of ink should I use on the plastic luggage tag to add my contact info? A: We highly recommend using an oil based paint marker/pen. This type of ink will not smear or rub off of the plastic when applied correctly and allowed to set. Q: Will your shirts shrink when I wash them? A: Our shirts are a polyester/cotton blend and are pre-shrunk, however, expect a little shrinkage after the first wash. Our shirts are also Semi-fitted so please take this into consideration when ordering your shirt size. Please see our T-Shirt Page for our size chart. Q: How should I care for my apparel items? A: We recommend washing our shirts inside-out with like-colors in cold water. Tumble dry with Low heat. Do Not Iron. Q: How are your shirts printed? We use both Screen Printing and DTG Printing. Screen printing allows us to mass produce our most popular designs, whereas DTG printing allows us to print in smaller batches and custom shirts for individuals. Both methods produce high quality images, however you may notice slightly brighter colors with our screen printed shirts because screen printing allows us to put down a white base layer under the artwork. Q: I have never used PayPal before, do I need an account? A: No. Although having an account will speedup the check-out process, a PayPal account is not necessary in order to complete your order. Q: Are you a verified PayPal Merchant? A: Yes! We are PayPal Verified! 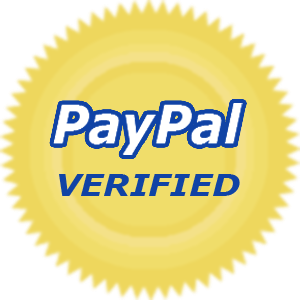 To see our PayPal Verification Status Click Here (You must have PayPal login credentials in order to view). A: We use the United States Postal Service for all of our domestic shipping; therefore, we can ship to PO Boxes, APO's, and US Territories. Q: How long does it normally take to receive my order? A: Depending on the service you choose, USPS Priority mail is a 2-3 day service whereas USPS First Class Mail may take up to 9 business days to receive when shipped in the contiguous United States. Orders shipped to Alaska, Hawaii, US Territories, and APO's may take several weeks to receive when shipped via First Class Mail; therefore, we highly recommend using USPS Priority Mail when shipping to these type of destinations. Q: I live in California, will I be charged sales tax? A: No, only residence of Texas are charged sales tax at a rate of 8.25% (Denton, Denton County, Texas tax rate). Q: I own my own FBO or Pilot Shop, can I order your stickers wholesale? A: Yes! We offer wholesale discounts for resellers. Please contact us to learn more about our wholesale program to apply to become a dealer. Q: Do you allow custom orders? A: Yes! We can make special orders for any one of our products or start from scratch with a custom design. Special and custom orders require a minimum order quantity (MOQ) at our wholesale pricing and custom orders incur a one-time design fee. MOQ varies per item. A: Generally, yes. You can return or exchange unused/unwashed/unopened items. Items returned opened, used, or washed/soiled may not be accepted or may incur a restocking fee, depending on condition and at our discretion. Please see our Returns and Exchanges page for more information.